Caught way up on the mountain, no one is safe, from the archetypal nightmare of Tony Kurtz, seen to freeze to death by his stranded rescuers as he hung off the Eiger, to events that unfolded on the Grand Teton, where rescuers narrowly escaped being clubbed to death by their reluctant rescuees. This collection of 35 first-hand accounts will shock and inspire in equal measure. Here is the original draft of Joe Simpson's classic Touching the Void and the first full telling of Jamie Andrew's extraordinary rescue from the Alps, which made headlines in 1999. Plus a specially commissioned account of the epic winter rescue on Mount Ararat, 2000 - the most remote mission ever undertaken by a helicopter-rescue team. And the rescuers own grim battles for survival. Compiled by one of the world's most respected mountaineers, this volume spans five continents - from the Appalachians to Mount Cook, from Peak Lenin to Siula Grande. 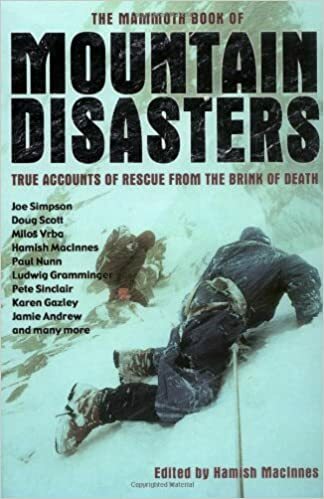 It includes some of the brightest stars of mountaineering and mountain rescue: Joe Simpson, Doug Scott, Pete Sinclair, Milos Vrbe, Paul Nunn, Ludwig Gramminger, Karen Glazley, Ken Phillips and Blaise Agresti.